When I was a child, no dinosaur had feathers. Nowadays it seems like they're putting feathers on everything. And while feathered dinosaurs can certainly be cool . . . where did this all come from? Which dinosaurs had feathers, and which ones can I still imagine as scaly reptilian monsters? Let's start with theropods, the two-legged, usually-meat-eating dinosaurs (and the group that ultimately gave rise to modern birds). Some of the earliest theropods to "branch off" the main theropod evolutionary branch were the ceratosaurs and the carnosaurs. We have good skin impressions for at least one species in each group ( most of a Carnotaurus in the ceratosaurs, and some juvenile Allosaurus skin for the carnosaurs) and both show only round-ish, non-overlapping scales (the Carnotaurus also has rows of large spikes running down the side of its body). In none of these early-divergent theropod groups are any feathers found. So in these early branches on the theropod family tree, scales, not feathers, were likely the norm. "Sinosauropteryxfossil" by Sam / Olai Ose / Skjaervoy from Zhangjiagang, China - Dinosaurs!. Licensed under Creative Commons Attribution-Share Alike 2.0 via Wikimedia Commons. That soft, fuzzy stuff running down the back, down the legs, and banded around the tail is basically the first dinosaur feathers: just a simple, fuzzy coat. Sinosauropteryx and Juravenator both had feathers like this; Compsognathus, despite being preserved in just the right kind of sediment to show feathers, only has signs of a few scales on the tail. (Juravenator also appears to have had a mix of feathers/scales, with scales on parts of the legs/tail). So within the compsognathids, feathers were not necessarily universal, and didn't necessarily coat the entire body in every species. The next group to branch off the theropod line was (probably) the tyrannosaurs, and this is where people get emotionally invested. Because to many of us (myself included), Tyrannosaurus must have looked like it did in Jurassic Park. We do have some small patches of scaly skin referred to large tyrannosaurs from Alberta and Mongolia (probably Tyrannosaurus and Tarbosaurus), but this is fragmentary material and not necessarily indicative of full-body covering. The tyrannosaurs we have good information for, Dilong and Yutyrannus, were covered in branched down-like feathers (branched, but no central shaft like modern flight feathers). Dilong tail feathers show simple branched filaments as well. These two tyrannosaurs had thick, fluffy, downy feathers, but there's still those (presumably) large tyrannosaur patches of scaly skin out there to contend with. So large tyrannosaurs may have secondarily lost their feathers (like elephants and rhinos are practically bare-skinned compared to their fuzzy mammalian ancestors), or large tyrannosaurs may have been feathered in some places and scaly in others, like the earlier compsognathids. We don't know yet. The next group of theropods to branch off were the ornithomimids. The Royal Tyrrell Museum in Canada has some incredible fossils of Ornithomimus, two juveniles and an adult. The juveniles are covered with the same downy fluff as the tyrannosaurs . . . but the adult had much longer, wing-like feathers on its forearms. You can see all the figures from the Ornithomimus paper here. So by the time the ornithomimids split from the theropod line, theropods had evolved not only filamented downy feathers, but also feathers with rigid shafts. And their shafted feathers were arranged in a wing-like pattern on their forearms, but almost certainly nothing had yet used these "wings" to fly, or even glide. "Caudipteryx zoui, feathered dinosaur plate, Early Cretaceous, Yixian Formation, Liaoning, China - Houston Museum of Natural Science - DSC01866" by Daderot. Licensed under Creative Commons Zero, Public Domain Dedication via Wikimedia Commons. 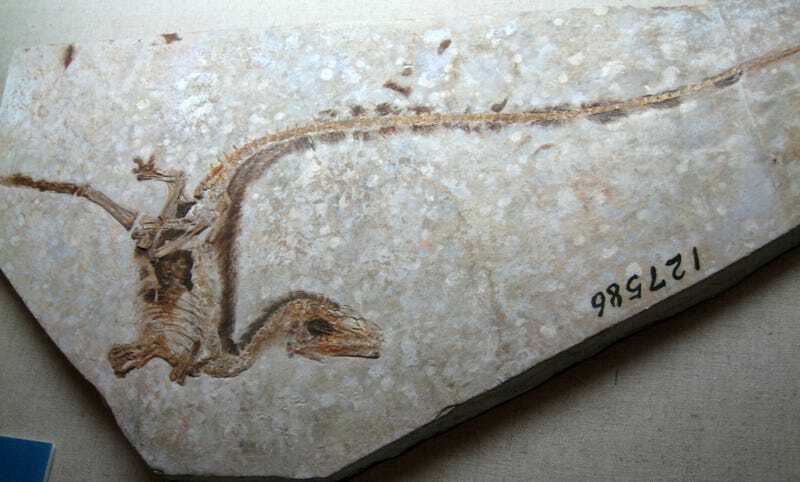 The best example of therizinosaur feathers is a fossil specimen of Beipiaosaurus, which you can see on the Chinese Academy of Sciences website. As you can see, this is no light fluffy covering anymore. This animal (which probably ate plants, a rarity among theropod dinosaurs) was like a giant shaggy sloth, only with feathers instead of hair. This is where modern birds probably hopped off the theropod evolutionary train. Theropods split between those that would go on to become modern birds, and those that would remain non-avian dinosaurs in the form of troodontids and dromaeosaurs ( Velociraptor is included in the dromaeosaurs). The best example of dromaeosaur feathers (though not the first) is Microraptor. This little dromaeosaur wasn't a true bird, but it did have wings: both on its arms, and on its legs. "Microraptor gui holotype" by David W. E. Hone, Helmut Tischlinger, Xing Xu, Fucheng Zhang - Hone DWE, Tischlinger H, Xu X, Zhang F (2010) The Extent of the Preserved Feathers on the Four-Winged Dinosaur Microraptor gui under Ultraviolet Light. PLoS ONE 5(2): e9223. doi:10.1371/journal.pone.0009223. Licensed under Creative Commons Attribution 2.5 via Wikimedia Commons. Another dromaeosaur specimen, Sinornithosaurus, had well-preserved feathers that said something interesting. Dromaeosaur "wing" feathers look a lot like bird wing feathers. They have a central shaft, and branches coming off them to either side. But in modern birds, the branches all lock together to make a really stiff surface; in dromaeosaur feathers, those branches didn't lock together. Smaller dromaeosaurs may have been able to, say, glide small distances, but without the locking branches, their feathers would have let a lot of air through, and would have been poor equipment for flight. While they haven't been found with feathers per se, Velociraptor forearms have "quill knobs" (click for image), which in modern birds act as anchor points for the long, heavy flight feathers. With so many wings and wing-like structures on every side, it's hard to imagine that Velociraptor didn't itself have wings (though it almost certainly didn't use them to fly) and feathers covering its entire body. Nobody contests that birds had feathers, so it's hardly worth posting fossil evidence. But it's flippin' famous, so here's an Archaeopteryx. "Archaeopteryx lithographica (Berlin specimen)" by H. Raab (User:Vesta) - Own work. Licensed under Creative Commons Attribution-Share Alike 3.0 via Wikimedia Commons. Here we have our first actual flight feathers: stiff vanes down the center, with branched filaments coming asymmetrically off the center vane, and unlike in the dromaeosaurs, the branches all interlock to create a stiff, air-resistant lifting surface. It's worth pointing out that this animal (and many other early birds) had wings on the legs too, just like their dromaeosaur cousins. And that's it for the theropods! But what about the non-theropod dinosaurs? Did they have feathers too? Evolutionarily, sauropods are the closest relatives of theropods. Sauropods did not have feathers. We have skin impressions from all kinds of sauropods, including a few baby sauropods still in their eggs (click for image). No feathers, not even downy fluff . . . only small, round, non-overlapping scales. A few sauropods, including Diplodocus, have been found with a row of spines running down their neck, back, and tail. Similar to the spines in modern iguana, they offer a glimpse into sauropod ornamentation . . . but these are almost certainly unrelated to the feathers we see in theropods. "Edmontosaurus skin" by A.E. Anderson - Osborn, Henry Fairfield (1912). "Integument of the Iguanodont Dinosaur Trachodon" (PDF). Memoirs of the American Museum of Natural History v. 1: Plate VII. Retrieved on 2009-03-11.. Licensed under Public domain via Wikimedia Commons. "Centrosaurus skin" by Barnum Brown - http://digitallibrary.amnh.org/dspace/bitstre… Licensed under Public domain via Wikimedia Commons. See? Scales all the way down. There are two (or three?) ornithischian specimens that bear further mention, however. Early in ornithischian history, after they'd left the theropods and sauropods behind but before the ancestors of stegosaurs or hadrosaurs diverged, a group called the heterodontosaurs broke off the main ornithischian line. One heterodontosaur, Tianyulong, was found covered neck to tail in long bristles (click for photo). It's like a two-legged porcupine. "Psittacosaurus mongoliensis" by Ghedoghedo - Own work. Licensed under Creative Commons Attribution-Share Alike 3.0 via Wikimedia Commons. Notice above, esp. behind the hind leg, that you can still see lots of "traditional" pebbly scales, too. 99% of this dinosaur's body was still scales, it just had a little tuft of bristles back there. Either way, it's entirely likely that more ceratopsians, and ornithischians in general, sported some kind of bristles on at least small patches of their bodies, adding a bit of spiky flair to their otherwise scale-covered hides.